Hi there! 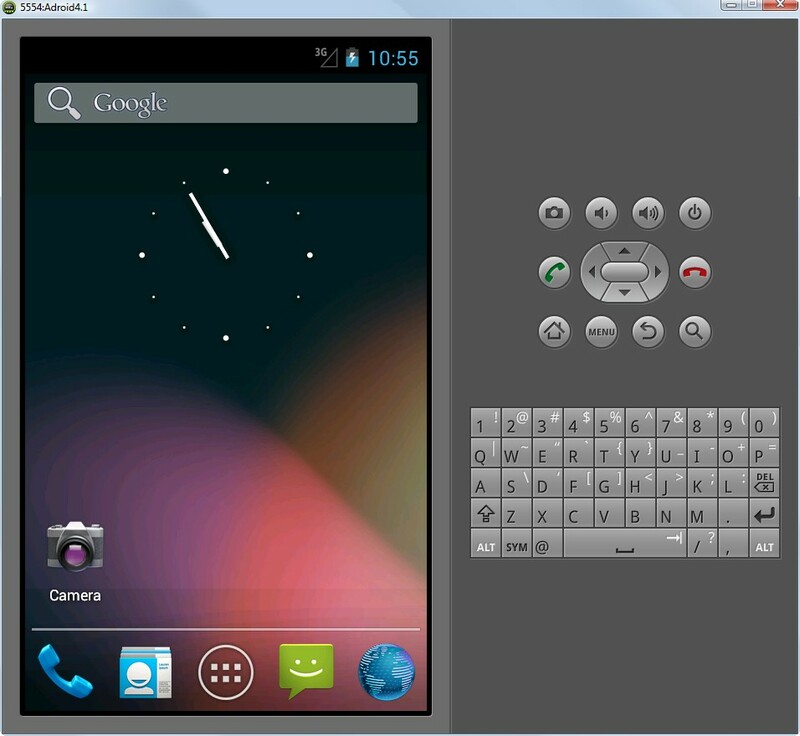 I've started programming Android Apps a few days ago and i had some problems while getting started with. 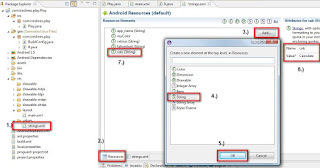 Prerequisite for going ahead with this blog, is the post How to install phonegap for android. So i assume you've read and done all the steps in it first. As we can see, i've highlighted the most important classes in the android project structure we must know and understand to go on without big problems. 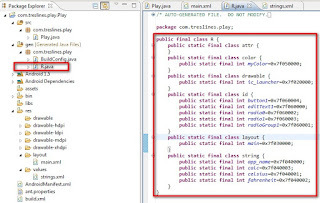 In my case above the class Play.java is the place in which i will code my Apps' logic as we will see later. 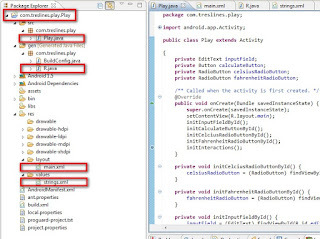 (add Listener to buttons, handle user actions and so on...) Further we have in the package gen the class R.java (This is a Resource class) This class is autogenerated and you should not do anything here. 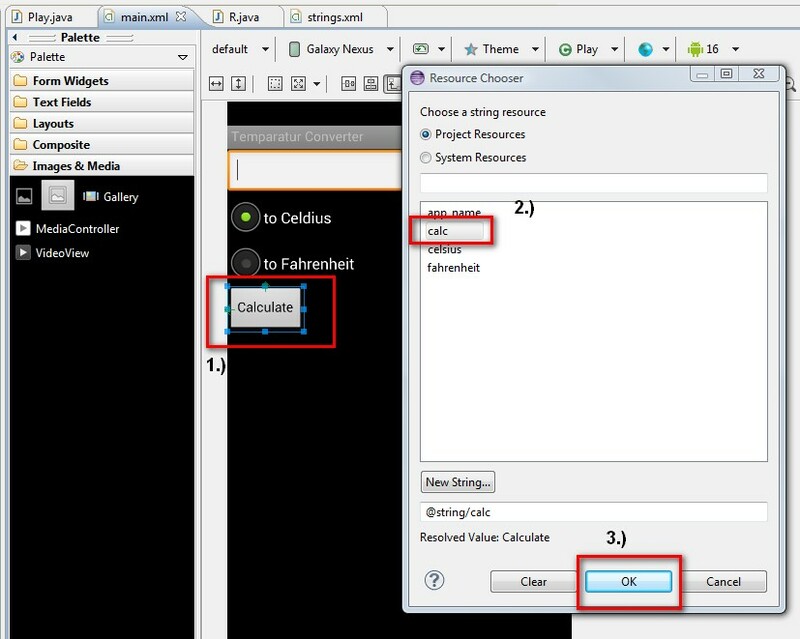 Everytime you add a widget like a button, textfield, layout and so on to your app (we will see how to do it later on), eclipse will automatically generate a resource id for you and store it in this class. this is good to know at the beginning because you'll see this class a lot of time when programming your App's logic later. By me it looks like that bellow: (again don't worry if it looks different by you at this point of the post. It will look like that once we have done all steps in this post) I'm showing it to you, so you can familiarize yourself with. 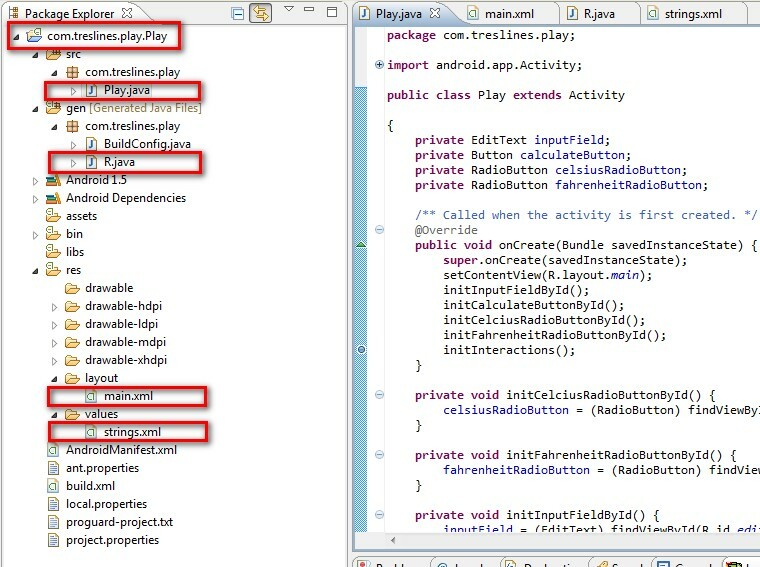 As you can see, there is a lot of public final classes with public static id's. 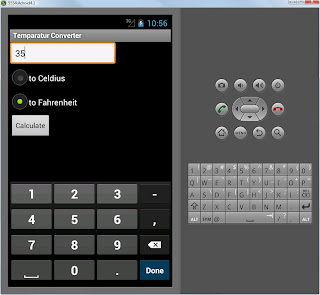 Thats the way an android app references and identifies its widgets as we will see while programming our logic later. That's important to know. Ok let's go ahead. 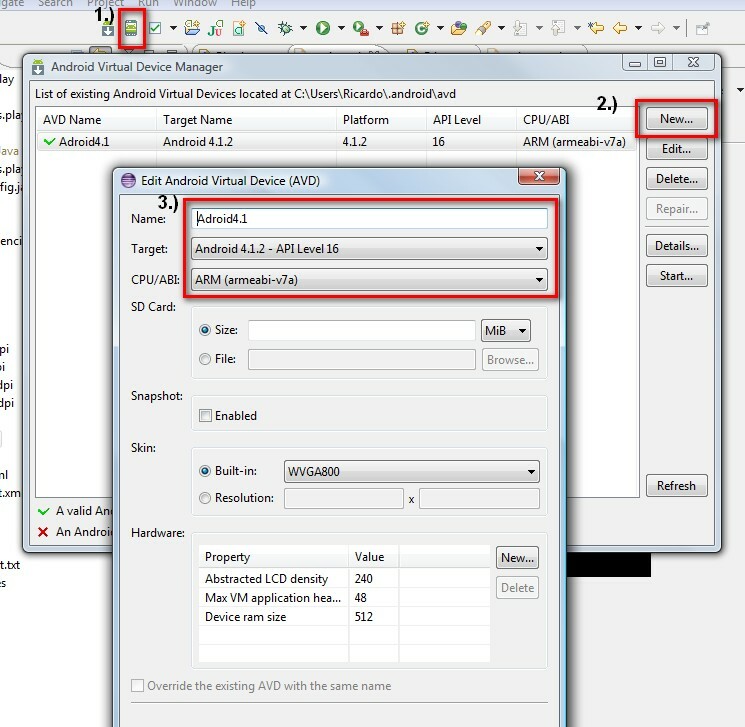 First of all we must define an emulator, setup a phone type and the version of the API you expect to use. Let's do it step by step. Let's define an emulator first. follow the steps bellows an press OK after step 3. Ok! almost finished! 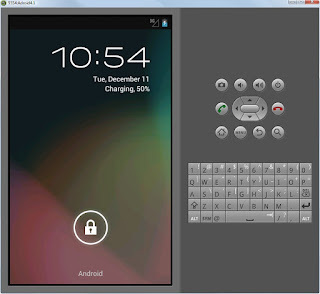 Let's define now the phone type and the Android API version you want. 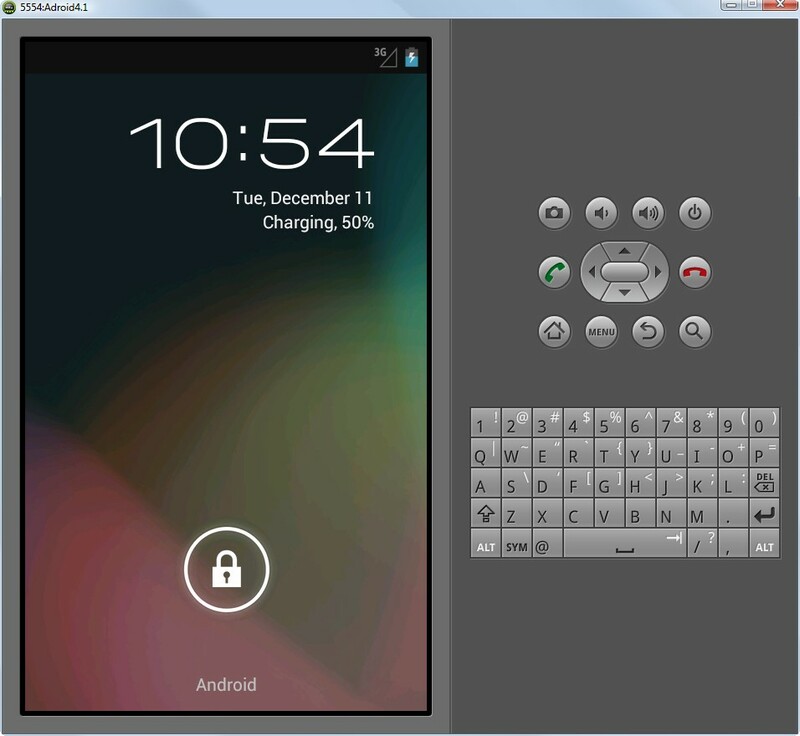 In my case i choose Galaxy Nexus and API 16 Android: 4.1.2. It is up to you to choose whatever you want. OK now i wanna show you how to set the externalized strings to you widgets without writing it by hand in the main.xml file. Go ahead and change back to the Graphical Layout view > select the calculate button > right mouse click on it > edit text... > choose the string calc from the options > OK > done! Cool right! 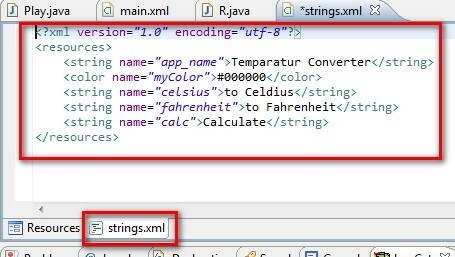 That's a very cool way to set the strings to you widgets without having to edit the main.xml by hand. 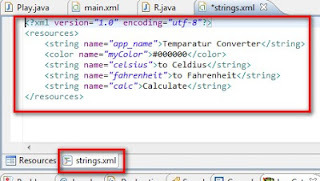 try to get familiarized with playing around, looking into those files: R.java, strings.xml, main.xml, Graphical Layout and Resource tabs. 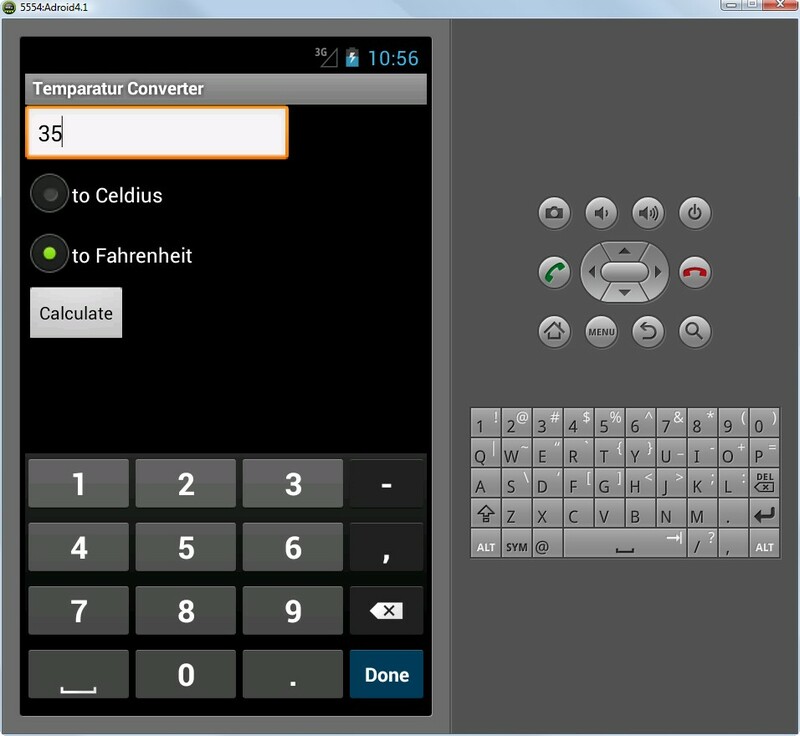 Ok, now it is time to do the last step programming our logic for the Temperatur Converter. In order to save time copy the code bellow and paste it in your class which extends from the class Activity. In my case it is the class Play. Try to understand it. The code should be very expressive. 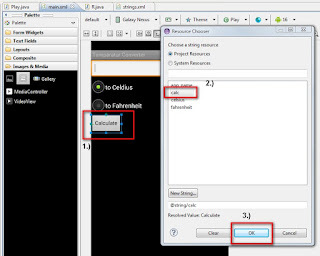 If you have already some expirience programming GUI you'll have no problem to understand it. I first init all variables in the method onCreate(), then i program the logic in the method onButtonPressed(). 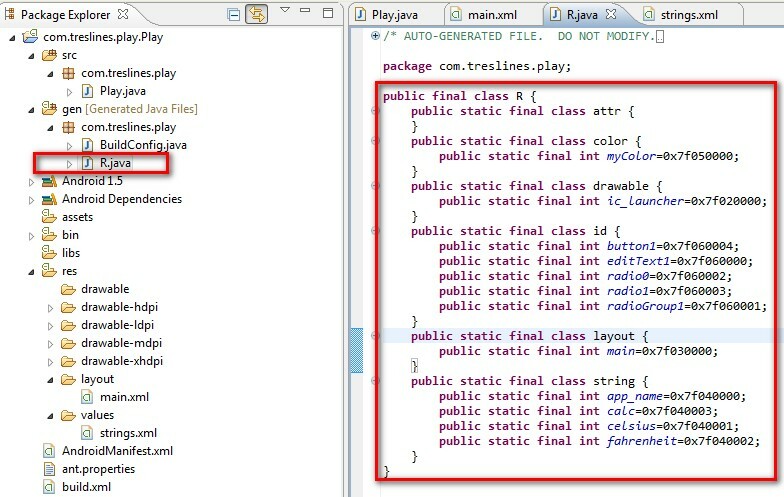 Pay attention to the references to the class R.java we have seen at the beginning of this post. It should be very familiar to you now. Seriously, This is the excellent blog for android developers who has start their developing act. We can study whole blog and get good guidance for programming. This is a great blog for Android developers, which began in the act. We can study the whole blog and get a good programming guide. Thank you very much for sharing. 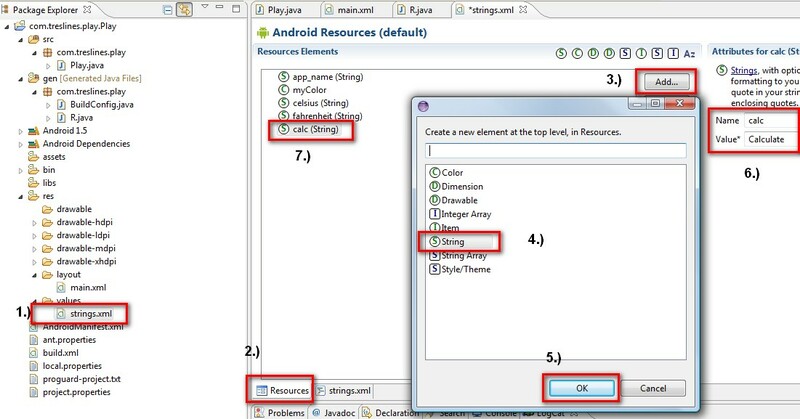 I have read this blog and got lots of information for developing first Android app which is very helpful for those people who want to develop the first android app.This is really good code sharing on this blog so thanks for giving this information. I got the issue. 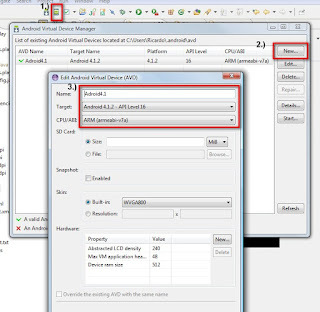 I forgot to make JAVA_HOME, AWT_HOME, ANDROID_HOME environment variables. After creating these variables, it's working fine. 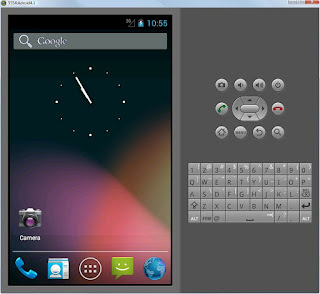 Thanks for this Excellent steps to Develop Android Apps gives easy development environment. It´s people like you who make the Internet to a such fantastic and great forum for collaboration and learning First Android App Step by Step . Keep up the good work! 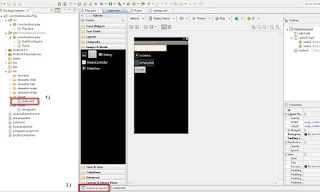 The other day, I was discussing (http://cleancodedevelopment-qualityseal.blogspot.in/2012/12/first-android-app-step-by-step.html)with my colleagues and they suggested I submit an article of my own. Your site is just perfect for what I have written! For sure! ;-) i've written to your email contact. Thank you for such a great article for beginners like me. I am looking for a similar step by step guide for iOS using Phonegap. I couldn't find one on ur site. Is there one on this site? 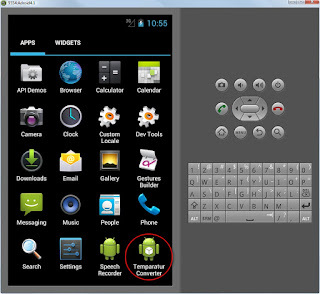 Mobisoft Infotech delivers the Android technology expertise necessary for your Android app development project. We also help businesses to improve their operational efficiencies, cost structure and remain technologically competitive. thank you for sharing. its really very helpful for the beginners. i got some great idea from this. waiting for the another post like this one.